appbasedlearning.com announces 20% of its App download revenue will be donated to childrens charities. Independent App design house appbasedlearning.com announced today that it will donate 20% of its kids educational App download revenue to charities that help children. appbasedlearning.com has named the program “Giving Back” and believes donations could really impact the lives of kids. The announcement coincides with the launch of appbasedlearning.com’s new flashcard app Fly By Numbers. Following the first donation to a Detroit children's charity that will be announced August 1 2014, appbasedlearning.com plans to make monthly donations to kids charities that help children all over the world. When appbasedlearning.com Apps are purchased, 20% of the selling price will be donated, if successful appbasedlearning.com could be really impactful, for example 100,000 downloads would generate approximately $40,000 in donations. Two appbasedlearning.com Apps are available on the App Store and both are included in the Giving Back program. Fly By Numbers is appbasedlearning.com’s newest offering and features Manny the Mole taking to the skies and flying flashcard airplanes, fun for all ages. 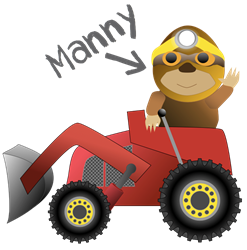 123 Dig also features Manny but is aimed at toddlers, Many must dig for the correct answer, rewards include new excavators and fun animations. Appbasedlearning.com is a Detroit based independent educational app design house that aims to make learning fun and leave a positive impact. appbasedlearning.com launched its first app in 2014 with the aim of making fun educational Apps for kids that develop math and arithmetic skills. Creator Pete Moss has developed appbasedlearning.com’s 123 Dig and Fly By Number as well as introducing the Giving Back program.